Gabrielle Union says she never doubted for a minute that she wanted to keep trying to be a mother — even after nine miscarriages. 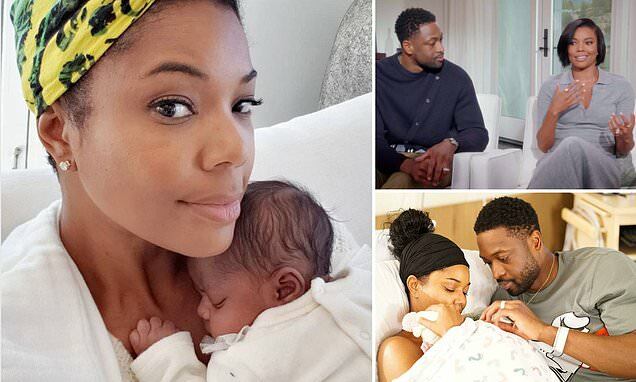 And now, the 46-year-old and her 36-year-old husband Dwyane Wade are the happy parents to a newborn daughter named Kaavia, whom they welcomed via surrogacy on November 7. But while Gabrielle was unwavering over the course of years of losses, Dwyane wasn't just suffering those miscarriages. As he told Oprah in a new interview, he was also worried about his wife's health. The couple sat down with Oprah for a special called Oprah at Home with Gabrielle Union, Dwyane Wade & Their New Baby, which will air on OWN on December 8 at 8pm. A clip aired on Good Morning America today, in which Gabrielle said that motherhood has been just as tough as she imagined. 'It looked exactly as it is. I saw motherhood and parenthood with very realistic eyes. It looked hard,' she said. But the wait was worth it. Gabrielle said that through the course of nine miscarriages, there was never a point where she wanted to give up and stop trying. 'I could not let go of this idea of creating life within me, that I could feel, that tied me to him, that he could be a part of, that the world could be a part of. Dwyane, though, was slightly less adamant when it came to what his wife had to go through.